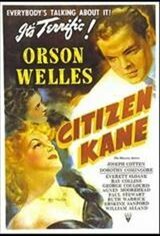 Citizen Kane, starring Orson Welles, Joseph Cotten and Agnes Moorehead, follows the life and death of a publishing tycoon named Charles Foster Kane. The newsreel editor feels that until they know the meaning of the last word he utteredRosebudbefore his death, they won't have the full story on Kane. He assigns a reporter to find Rosebud.